With coffee prices nudging ever closer to five dollars, it may come as a surprise to learn that not everything is getting more expensive in Port Melbourne. For the last seven years I've traipsed round the town's grocers hunting inflationary evidence of a tinned kind. Cat keepers have two fewer places to restock than last year, thanks to Whiskas not yet marketing a free-range or organic version of their cat food to satisfy About Life customers, and Quickstop deciding not to stock pet food any more. There's little movement amongst the remaining vendors though, with IGA selling at exactly the same price as back in 2010. 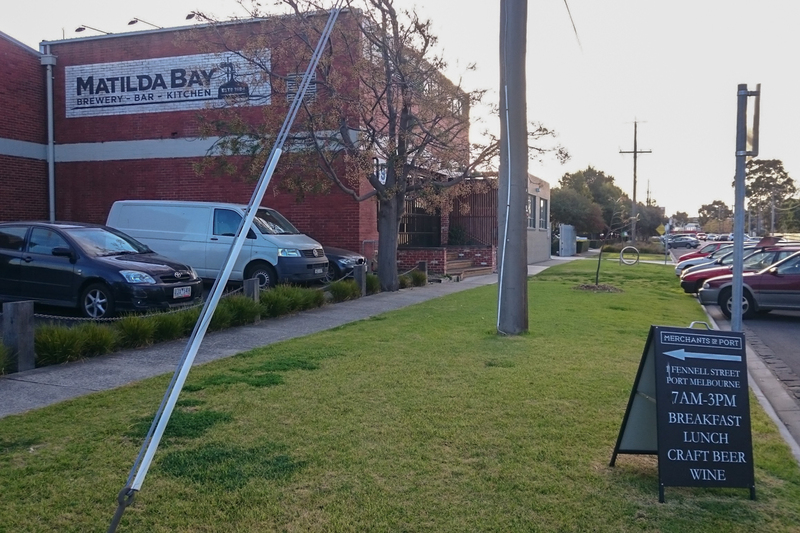 It's been a while coming, but finally the doors of Port Melbourne's very own brewery have been reopened to the public. Just like their Bertie Street predecessors, the Colonial Brewing Company started life over in WA, but unlike Matilda Bay they're still an independent brewer with deep roots back in the Margaret River. With poor old Matilda suffering the ultimate "craft" indignity of relegation to just one of CUB's messy marketing tools, it's encouraging to see the place in fresh hands. They threw a house-warming party to coincide with the start of Good Beer Week, and are aiming to open their bar every Friday night thereafter. I really hope we start to see some of their exiting new beers in our local bars and restaurants the rest of the week. 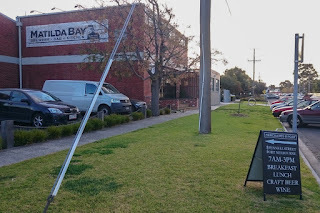 Under the stewardship of the parent Colonial Leisure Group, you can at the very least expect to see their (not at all) Small Ale nearby at the Albert Park Hotel and Lamaro's in South Melbourne. If you were passing Station Pier this evening, and thought you were seeing things, don't book your emergency optometrist appointment just yet. 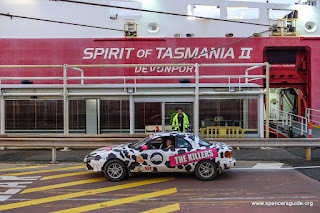 For the "New" Spirit of Tasmania was indeed loading up some two hundred "shitbox" cars, with pirate-dressed drivers, on the final leg of their charity rally to Hobart. 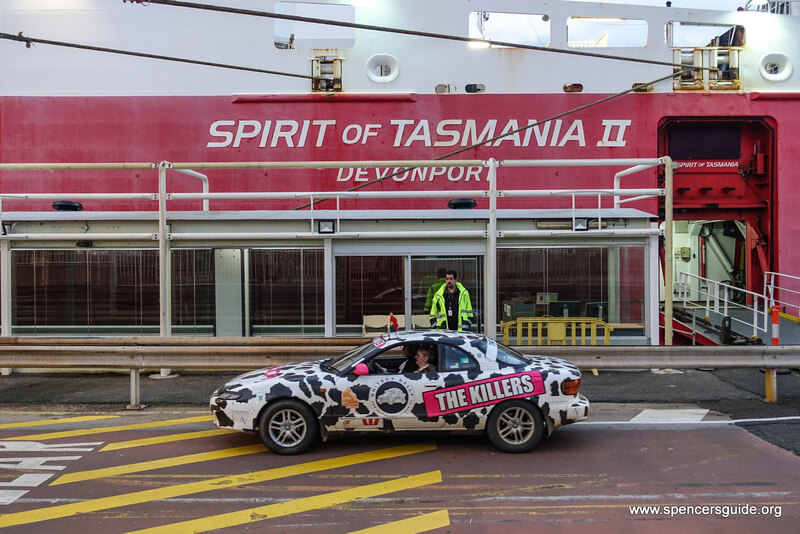 Decked out with crazy paint jobs and sporting cheeky team names like Trough Lollies, Two Dicks Outback and Didyabringyagrogalong, the officially sub $1000 cars had driven the road less travelled from Mackay to raise money for the Cancer Council. And with almost $1.5 million banked, it looked like there'd be plenty of well deserved celebrations going on overnight. Could it be that the vanity tide is finally turning? For a while it seemed that every change of Bay Street business brought with it yet another hair salon or beauty parlour. But the peak of that trend may have passed last year with Belvga taking over from the Secret Stylist. Continuing the local love affair with pun-based business names, Thyme for Living has moved its boutique homewares and gifts into the almost opposite store, previously occupied by Body Bronze. For many it really was a rude awakening on Bay Street this morning, as twenty MFB units battled the blaze at the former Port Melbourne Theatre, closing off a slew of neighbouring streets in the process. Fortunately no-one seems to have been seriously hurt. I'd already drafted a post about Brew'd Awakenings, the punny Manhattan themed replacement of the Simple Affair café and alternative therapy centre. It had maintained the same cavernous open-brick interior, although with the counter moved to an island in the centre, bizarrely concealing the best tables behind it. It would be unseemly now to mention how I rated their coffee and food. The one ominous observation that does linger though is how much chunky timber, much of it with their blackened logo burnt on to it, there was. I just hope that the distinctive structure of this heritage building can be saved. It's a shame in a way that the impressively creative design painted upon this Raglan Street fence didn't sneakily use the official palette of exterior paint colours for heritage houses in this borough (which, incidentally, really ought to be displayed in the paint aisle of Bunnings). It landed the owner in strife with VCAT last year, but then there's many a charcoal grey exterior in Port Melbourne that also flouts the rules, albeit in less extravagant fashion. IMHO heritage controls benefit communities as a whole more than they do individual property owners and there is risk in making exception, even for well-liked cases, in precedent being set and then later abused, more for financial benefit, than artistic merit. However the only way I can see it being fair for Alex Skopellos to paint over his colourful design, which his neighbours seem to like, is if it's part of a wider clamp down on the slow erosion of traditional street frontages.